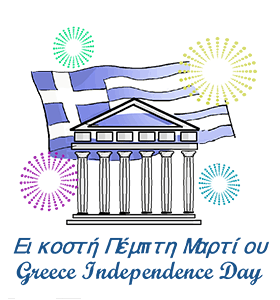 ﻿Greece Independence Day: Calendar, History, Tweets, Facts, Quotes & Activities. Greek Independence Day celebrates the anniversary of the declaration of the start of the Greek War of Independence from the Ottoman Empire. On 25 March 1821, Greece revolted against the Ottoman Empire, of which it had been part for nearly 4 centuries. The war lasted until 1829 and required the assistance of Russia, Britain and France. Greek Independence Day is celebrated on 25 March annually. It is a major public holiday that celebrates Greece’s sovereignty, pride and culture. Within the first month of the war, 30,000 Muslims in the town of Peloponnese disappeared without a trace. They were reportedly all walked to a remote field and slaughtered. There are reports that the Greek War of Independence was met with little resistance from the Ottoman military. Instead, the Greeks were largely killing non-combatants Turks in various towns. Before Greece fought its war for independence it had been under the rule of the Ottoman Empire. However, despite 400 years under a foreign ruler, much of the Greek culture was maintained because of the legendary tolerance from the Ottomans to the various groups of people it ruled. Currently in Greece it is illegal not to vote. The democratic process of voting is mandatory by law for every citizen who is over the age of 18. All civilization has from time to time become a thin crust over a volcano of revolution. – Havelock Ellis, English physician, writer and social reformer. Attend the Armed Forces parade in Athens and Thessaloniki! This is one of the biggest displays that takes place on Independence Day and it is meant to honour the soldiers that fought for Greek sovereignty during the war against the Ottoman empire. Have a Feast of Annunciation. The feast is enjoyed on the same day as Independence Day. It is usually enjoyed by families in their homes and consists of traditional Greek dishes such as spanakopita and moussaka. There are also church celebrations on this day. Read a book about Greek heritage and its struggle for sovereignty. Some of our favourites are: The Greeks , Alexander the Great , and The Cambridge Illustrated History of Ancient Greece . Spread awareness on social media about Independence Day by using the hashtags #IndependenceDay, #GreekIndependenceDay and #GreekSovereignty. Wear blue and white. It is customary to dress in the colours of the Greek flag on this day.